Following a request to 'sticky' this chart, here it is! But you'd think someone would have produced a chart in Celsius by now, wouldn't you? From reading about on the net , Method for using the chart after you've found your level of fizz you want. Chill the keg first , hook up your corny, set the psi to the desired level of fizz you want and in anything from 3-7 days you should reach your Carbonation. Dr. Dextrin wrote: Excellent Jim, thanks. A formula! Brilliant! Well spotted. 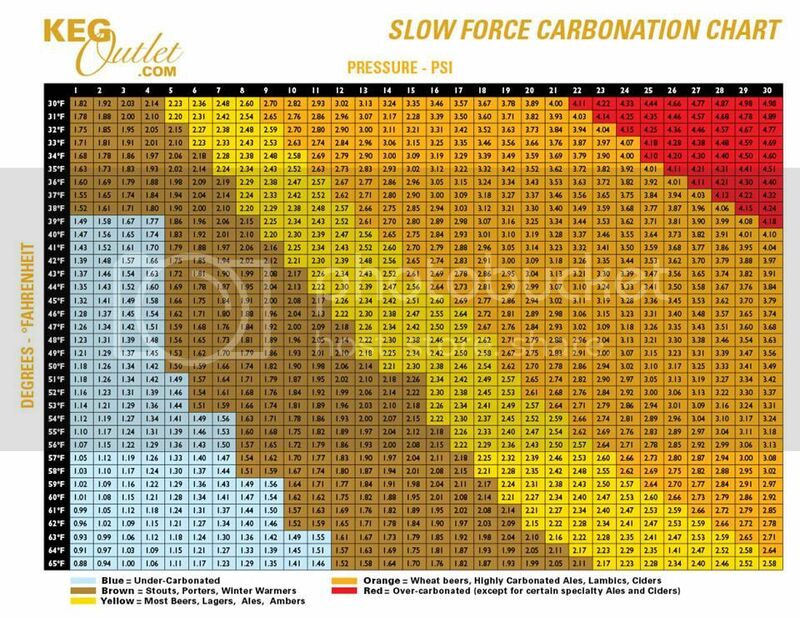 How much time does it on average take to carb when using this chart? 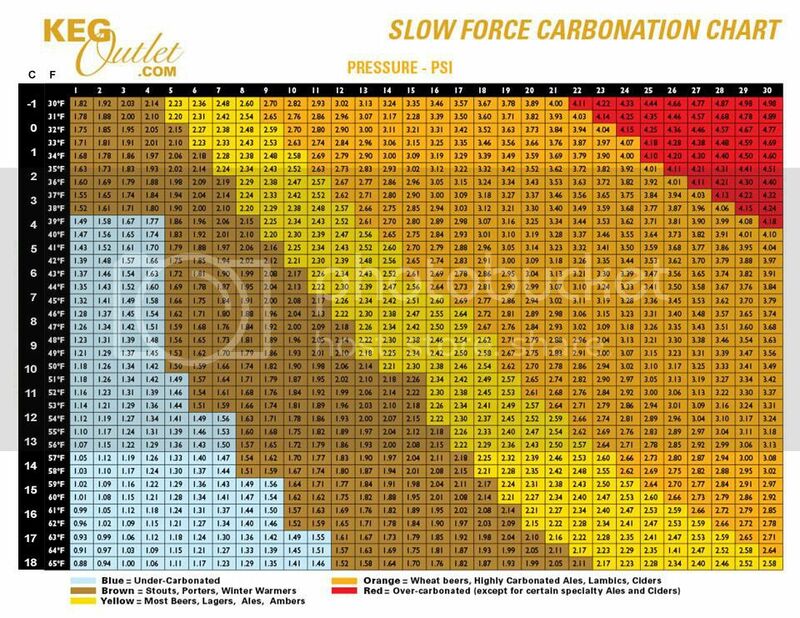 For example, will it take twice as long to carb a beer at 15 psi over one at 30 psi if your wanting the same level of carbonation? I hear a lot of people talking about over carbing but find so many different answers on how long people leave them for. Can someone inform me of what the numbers represent on each section within the graph? I always have issues with massive heads when i pour but i put it down to the size of my beer lines rather than over carbing. This graph is making me think ive over carbed. Temperature on the left, Pressure along the top and the numbers in the middle are volumes of CO2. Basically you decide how fizzy you'd like your beer to be (volumes of CO2) and then find the pressure you need for the temperature your beer is at. cheers Keith, it was the volume numbers i wasn't sure about. Can anyone answer Badgerdans question? I've been super-carbing for a week then turn the pressure down to serve and hey presto....foam. dmuz wrote: Can anyone answer Badgerdans question? I've been super-carbing for a week then turn the pressure down to serve and hey presto....foam. if you have over conditioned the beer, just vent the keg till the excess pressure has dissipated, it may take a few vents spaced out over hours or a day even to vent all the excess condition depending on how much you over conditioned in the first place.. just as a shake helps absorb co2 when under pressure when vented a shake will help release some of the condition again..
if just slightly over conditioned venting the keg while on gas can release just the excess pressure and allow a foam free pint to pour. my kegs are not in a fridge so i suffer from a bit of temp fluctuation and frequently suffer some over condition when the temp drops dramatically regardless of all my insulation..
i vent the kegs frequently and its not a lot of gas i can have upto 4 beers on tap tho its generally 2 or 3 and am on the same gas bottle i got about 18months back..
Carbonating pressure v serving pressure. What pressure are people serving at? I have a six cornie set up through a gas managment board, mainly lager and cider (i bottle everything else) with two in the kegerator. I carb up at about 25 psi currently and leave it as long as waiting to go in the kegerator. Can you over carbonate time wise as well as pressure wise? kinleycat wrote: Carbonating pressure v serving pressure. If I force carb in a fridge at 3 or 4 degrees then move into a kegerator at 12 degrees... should I pressurise for the 3-4 degrees conditioning then vent and re-pressurise to serving temp when moving to the kegerator?